randomness | What’s For Dinner? My original plan for dinner tonight was to make a Lean Cuisine frozen pizza and make some cauliflower on the side. Not too exciting, and I realized that it was something that was quite caloric and I’d be hungry an hour later, and be out of Points®. 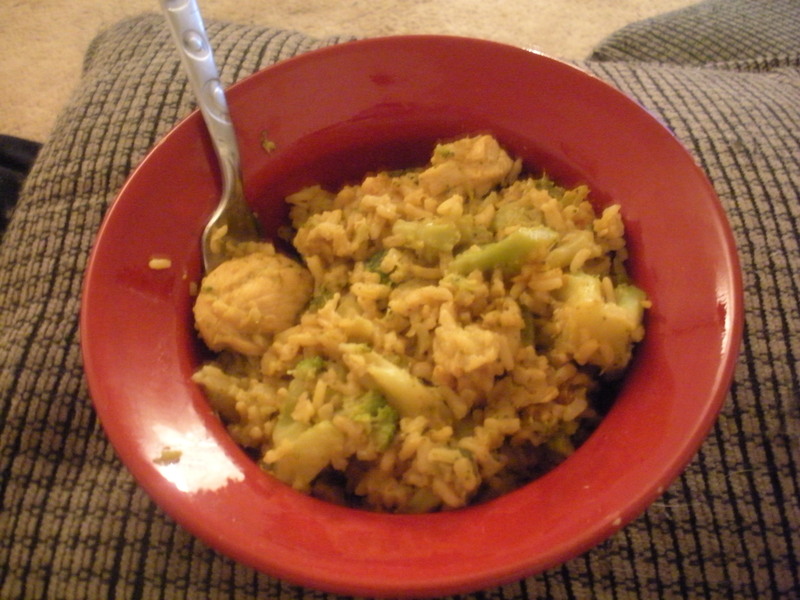 I decided to utilize the frozen broccoli florets I had to make a Thai-style chicken and broccoli with rice. Really, the only thing that was “Thai” about it was that the seasoning I used on the chicken tastes just like the stuff they put on our chicken satays at our favorite Thai place! In any case, this was a very low-Point® and satisfying meal. I love my red bowl! In a large frying pan or wok, heat the olive oil. Once its very hot, add the chicken and sprinkle the Sate Seasoning over the chicken. Stir well. Add the broccoli, broth, and quick rice. Cook a few minutes until rice is tender, and add remaining seasoning. Stir, and taste. Add more seasoning to your liking and eat! I ate today’s dinner in my favorite red bowl. My mom got me that red bowl when I moved into my very first non-dorm, non-sorority-house off-campus house in college. At one time, there were 2 of them… one fell to the careless moving god, and the other continues to make me happy every time I use it! Sometimes, I’ll eat food out of my red bowl with a tiny spoon, which makes me über happy! On a non-dinner subject, I’m a) obsessed with the lemon and lime LÄRABARS!! I liked the other ones ok, but I had a lemon one this morning and I can’t stop thinking about it!! Must get more! And b) I’m so beyond happy that tomorrow is Friday, I can hardly stand it! I get new students after Thanksgiving, and I don’t need to lay eyes on any students between Monday and the Monday AFTER Thanksgiving! That’s right, folks, I’m off from Tuesday through Sunday! In the words of a gamer… w00t!